Author JK Rowling has told of her "excitement and dread" at writing the seventh and final Harry Potter book. Rowling admitted on her official website: "I can't quite imagine life without Harry." 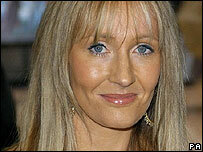 Work on the follow-up to Harry Potter and the Half-Blood Prince will begin in January, she added. "I contemplate the task with mingled feelings of excitement and dread, because I can't wait to get started," she wrote in a diary posting. "I have been fine-tuning the fine-tuned plan for [book] seven during the past few weeks so I can really set to work in January." Rowling admitted: "Sometimes, even at this stage, you can see trouble looming; nearly all the six published books have had Chapters of Doom. "The quintessential never, I hope, to be beaten Chapter That Nearly Broke My Will was chapter nine, Goblet of Fire." More than 300 million copies of Rowling's Harry Potter books have been sold worldwide. The most recent novel, The Half-Blood Prince, was published in July after a two-year wait and became a global best-seller.